Poha recipe with step by step photos - Poha is one of the most popular breakfast recipes in India. It is very healthy. It is neither too light nor too heavy! It can be prepared very quickly and easily. However, I have seen people struggling to get the perfect soft and flaky poha. Either it becomes too lumpy or chewy. 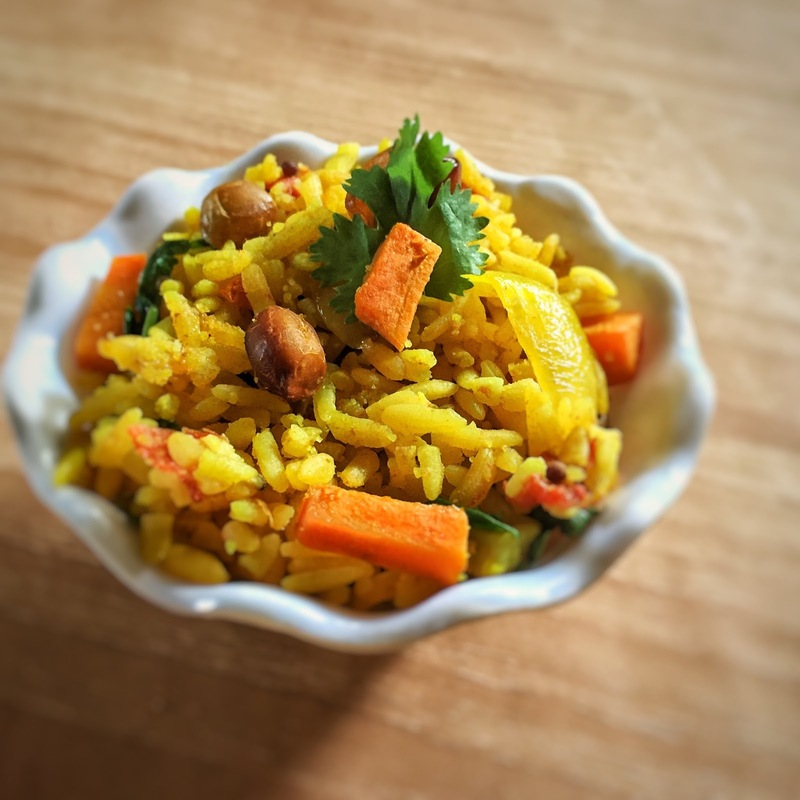 So, in this blog, I have tried to cover everything that can go wrong while preparing poha. I hope these tips and tricks will help you get the perfect poha every single time! Wash poha in a strainer. Add peanuts and saute them until they are a little dark in colour. Add chopped potatoes and a little salt in same oil. Cover it and let it cook on low flame. Once potatoes are cooked, keep them aside with peanuts. Now add a little more oil if required. Add curry leaves, chopped ginger and green chillies. Saute it for about a min on low-medium flame. Add sliced onions and turmeric powder. Add sliced carrots, capsicum and chopped beans. All these are optional. I have added carrot this time. Mix everything then cover it and let it cook for about 3-4 minutes on low-medium flame. Few people like properly cooked vegetable few like them to be crunchy. Meanwhile, check if the poha is soft enough. If not, then go ahead and wash it once more. Once these vegetables are little soft you can add tomato and salt. Cook it for another 2-3 minutes. Add potatoes and peanuts that we have kept aside in step 4 & 7. Mix everything well. Then add soaked poha. If your poha was very thick then you should wash it again before adding it. Mix it well and cover it for 2-3 minutes on low flame. Sprinkle some lime juice and garnish with chopped coriander leaves. Poha is ready! You can add some sev/aloo bhujiya before serving. 1. Wash poha in a strainer. Keep it aside. It will become soft in some time. If poha is really thick then wash it 2-3 times. 3. Add peanuts. Saute them until they turn dark in colour. Make sure that the flame is low. 3. Now remove peanuts and keep them aside. Add chopped potatoes in same oil. Add some salt. Cover it and let it cook for 3-4 minutes on low flame. You can skip this step if you want to use boiled potatoes. That will also taste good. 4. Once potatoes are done. You can keep it aside with peanuts. 5. Add a little more oil if required. Add mustard seeds in the same oil. Let it splutter. 7. Add chopped/grated ginger and finely chopped green chillies. 10. Add carrots. You can also add capsicum, beans etc. Cover them and let it cook for 3-4 minutes on low-medium flame. 11. While vegetables are getting cooked you can wash poha again under running water if it is not soft enough. Otherwise skip this step. 12. Once vegetables are soft you can add tomatoes and salt. 13. Add peanuts and potatoes that we kept aside in step 4. 14. Now it's time to add poha. Check if it's soft enough. If not then wash it again before adding. Mix everything well. Sprinkle some lime juice. Cover it and let it cook for 2-3 minutes on low flame. 15. Garnish it with coriander leaves and serve it. You can also add sev/ aloo bhujiya. The first tip is to find the right poha. For this recipe, you should get thick poha. Avoid using patla or thin poha or milk poha. Red poha also comes in two similar variations. For this recipe, you should take thicker one. The second important tip is to soak it correctly. Use a strainer! Earlier I used to wash and soak it in a bowl. Somehow that never worked for me. Wash it under running water in a strainer before you start cooking. Wash it once more while vegetables are getting cooked and once again before mixing it. This always works well for me.